Aqua, after she fell to darkness. Years and years of wandering through the realm of darkness ended with her being cast into the watery depths beyond its margin. Anti-Aqua is a boss in Kingdom Hearts III. After Aqua is corrupted by darkness and under the influence of Xehanort, Sora is forced to fight her in order to rescue her. Anti-Aqua is a corrupted version of Aqua. Her hair is a bleached blue, her eyes are yellow, and her once-white dress has darkened and become tattered. Her arms and legs have also begun to darken, and her hands are now black with red fingertips. In battle, she wields the Kingdom Key W after Mickey drops it during a fight with a Demon Tower. When she first reveals herself, Anti-Aqua initially appears as a black silhouette wreathed in a violet aura of darkness. Ansem, Seeker of Darkness arrives at the Dark Margin to confront Ansem the Wise about the children the former king used in his research. Aqua tries to fight Ansem, but his guardian subdues her, imbues her with darkness, and throws her into the seas of the Dark Margin, transforming her into Anti-Aqua. Anti-Aqua later confronts King Mickey and Riku when they return to the Dark Margin to find her. She has her Demon Tower restrain Mickey before emerging from it, picking up his Keyblade, revealing herself, and explaining the pain she has been through over the years she spent trapped in the Realm of Darkness. She and the Demon Tower then fight Riku, but Riku is able to destroy the Demon Tower and free Mickey with Sora's help. Sora battles Anti-Aqua and successfully manages to free her from the darkness. Anti-Aqua behaves nearly identically to the phantom Aqua from Kingdom Hearts 0.2 Birth by Sleep -A fragmentary passage-. She begins the fight by activating Spellweaver, and continues to fight in this mode. She usually attacks in tandem with doppelgängers, often firing homing orbs at Sora and performing spiraling attacks. All of these attacks can be guarded. She often teleports across the arena, and sometimes teleports before Sora can attack. When her retaliation point is reached, she often counters with an unblockable lunge. Occasionally, Anti-Aqua will wander across the arena with several doppelgängers, explaining her pain to Sora. While she and the doppelgängers will disappear after a short time, Sora can use Thunder to instantly expose the real Anti-Aqua. As her health dwindles, Anti-Aqua gains access to two ultimate attacks. The first, in which she teleports in the air before firing Blizzard shards, can be guarded or evaded. The second is the Spellweaver finisher, where she and three of her doppelgängers perform a spinning attack. Sora must dodge out of the spiral before the Anti-Aquas finish the attack, though if he is using a Formchange that blocks with barriers like Nano Arms, he should instead block. 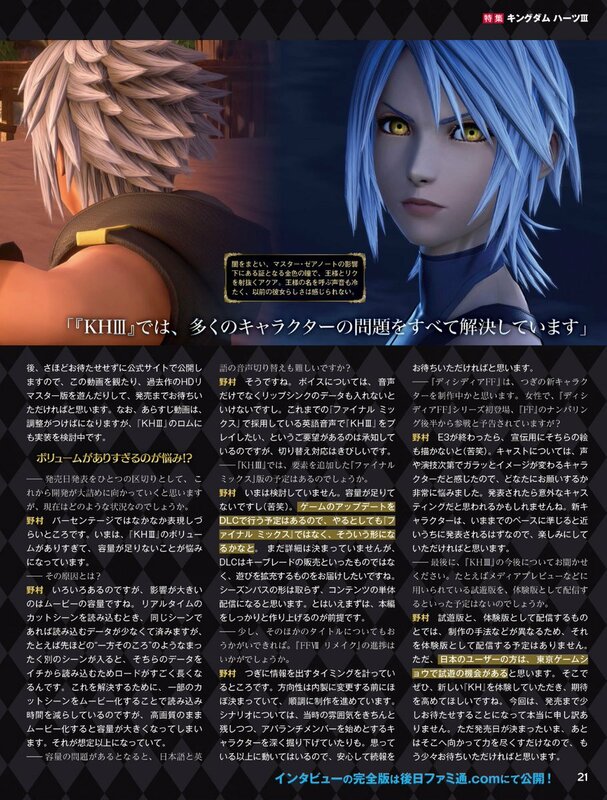 ↑ Tetsuya Nomura': "In the darkness, Aqua shoot at Riku and King Mickey, the golden eyes prove that she is under the influence of Master Xehanort. She called Mickey's name, but her voice was so cold. We couldn't feel any trace of her former self." This page was last edited on 25 March 2019, at 21:54.